At House Call Doctor Los Angeles, you'll find a physician that is dedicated to providing urgent care to Studio City residents who appreciate the comfort and warmth that comes from medical attention in their own homes. 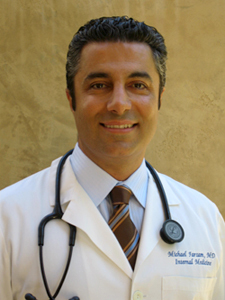 In fact, board-certified physician Dr. Michael Farzam is committed to providing every patient with a first-rate level of care and attention – the sort of care that is often a top priority to residents of Studio City. Located in the midst of one of L.A.'s most famous neighborhoods, residents of Studio City understand the importance of concierge services. Many of them also understand the time and energy commitment that comes from undergoing treatment at a 24 hour health clinic. That's why, when they are suffering from illness or in need of urgent care, Studio City residents commonly turn to Dr. Farzam. Studio City residents appreciate that the esteemed specialist will visit them in their own homes, offices, or nearly anywhere else they may reside. In fact, Dr. Farzam has even garnered a reputation as the hotel doctor who will arrive on time and pay attention to each patient's primary needs. The reasons why a Studio City resident might elect to undergo treatment from our house call doctor are varied. Some don't have a medical health insurance plan, while others are too busy in their lives to take time for a hospital visit. No matter what the reason, Dr. Farzam is almost certain to be the best option available. It is important to note that those who are suffering from life threatening emergencies should always contact emergency services by dialing 911. However, for many other medical needs our house call doctor can be the answer you're looking for. For more information on how Dr. Farzam and House Call Doctor Los Angeles can provide you with the finest available urgent care Studio City residents are likely to find. Call 310-849-7991 for further information or visit our contact page.